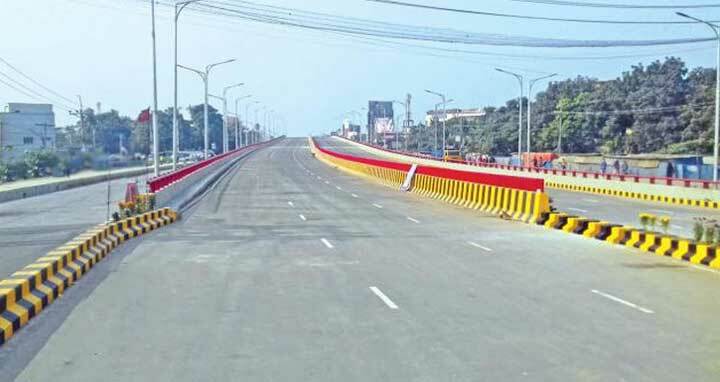 Feni, 4 Jan, Abnews: Prime Minister Sheikh Hasina has inaugurated the country's first ever six-lane flyover at Mohipal in Feni district on Thursday. The premier opened the six-lane flyover through a video conference from Gonobhaban this noon. Road Transport and Bridges Minister Obaidul Quader visited the construction site of the flyover recently and said that the flyover will be inaugurated by the prime minister. Quader said the construction work of the country's lone six-lane flyover has been completed six months ahead of its scheduled time. Sources said the construction work of the project begun on April 1 in 2015. The length of the flyover is 660 meters while the width is 24.62 meters. The service road length is 1,370 meters while the service road width 7.5 meters, footpath length 2,210 meters. The flyover has 11 spans and 132 guarders. Engineering Construction Division of Bangladesh Army and Mesars Abdul Monem Limited implemented the project at a cost of Taka 181.48 crore, the sources said. Feni Zila Parishad Chairman Aziz Ahmed Chowdhury said the six-lane flyover has been constructed as one of the landmark development programmes of the present government under the dynamic leadership of Prime Minister Sheikh Hasina.